According to survey data released on Thursday by the Pew Charitable Trust, eight percent of all Americans who are online use Twitter. However, Computerworld reports that a small percentage of the Twitter population is active on a regular basis. According to the report, only 25 percent of Twitter users responded that they Tweet on a daily basis. However, the survey results showed that people are much more likely to check their Twitter feeds than actively make posts, as 24 percent of all Twitter users said that they check their feed several times a day, while an additional 12 percent said they check at least once a day. 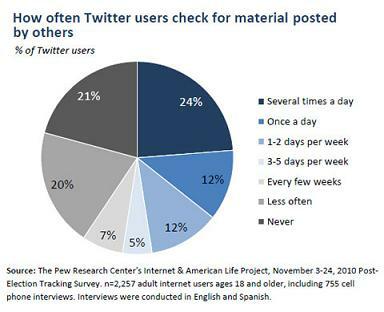 Not surprisingly, the most popular subject for Twitter users is themselves. Survey results showed that 72 percent of Twitter users post updates about their personal lives, compared to 62 percent posting updates about their work lives, 55 percent sharing links to news stories and 53 percent retweeting items tweeted by other people.